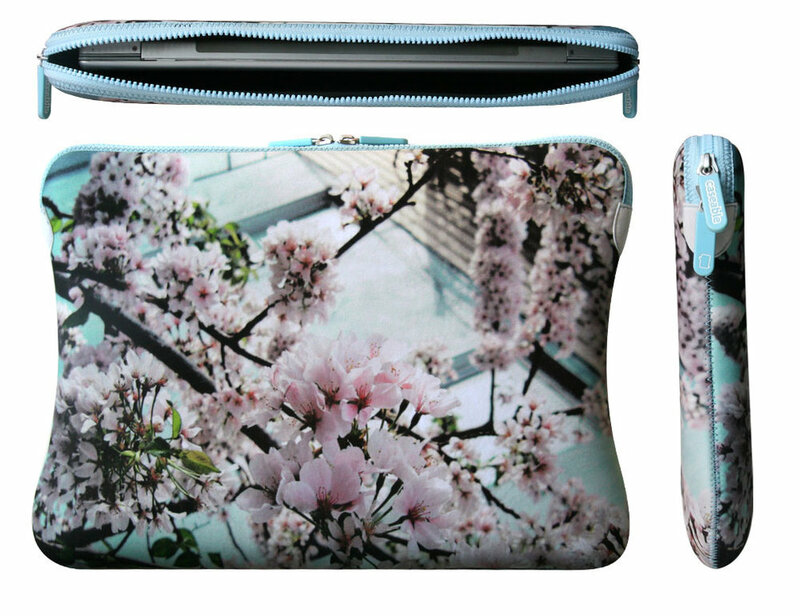 To design a line of tablet, specifically the first generation iPad, and e-reader cases that can be individually customized using dye-sublimation printing for case goods start-up, Caseable. 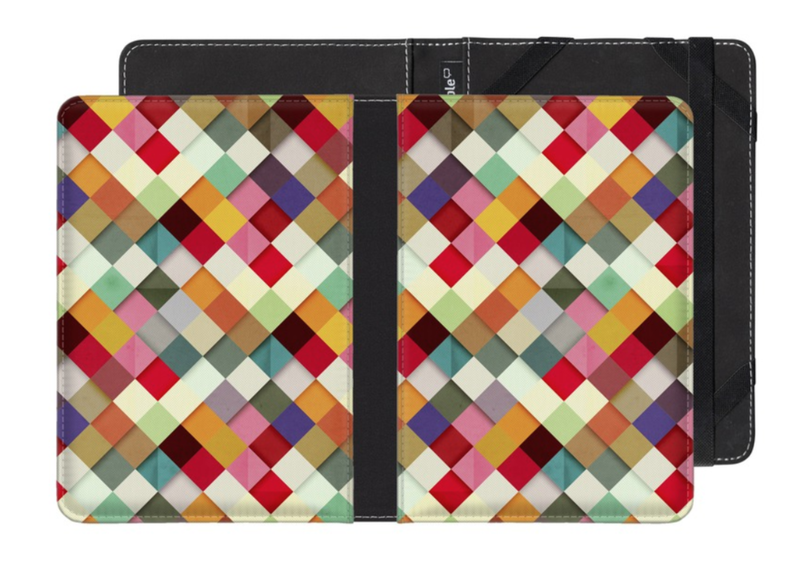 Caseable began as an e-commerce site allowing customers to order customized laptop sleeves with custom-printed images. They hired me to expand their line to include tablet and e-reader cases. I found the current production process for the original cases to be problematic and sought to streamline the process for the new line of cases. 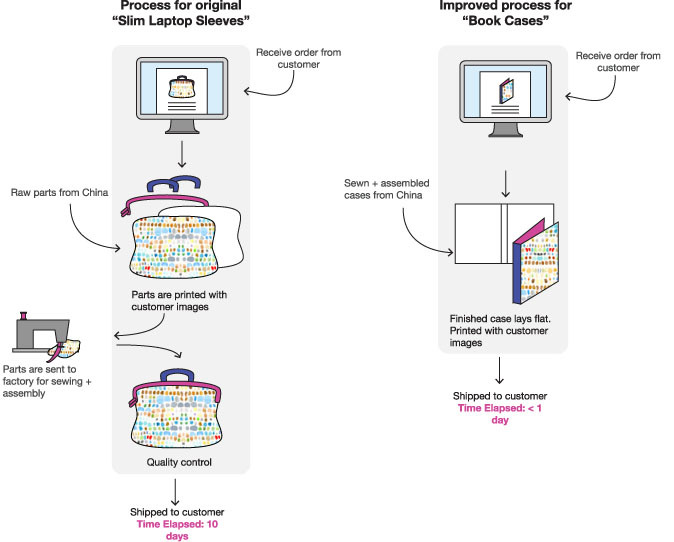 As described by the infographic below, the original laptop sleeves did not come fully assembled. Caseable printed pieces of the case in-house, then sent them to an outside factory to be sewn, then received them back in-house to check for quality and to ship to the customer. 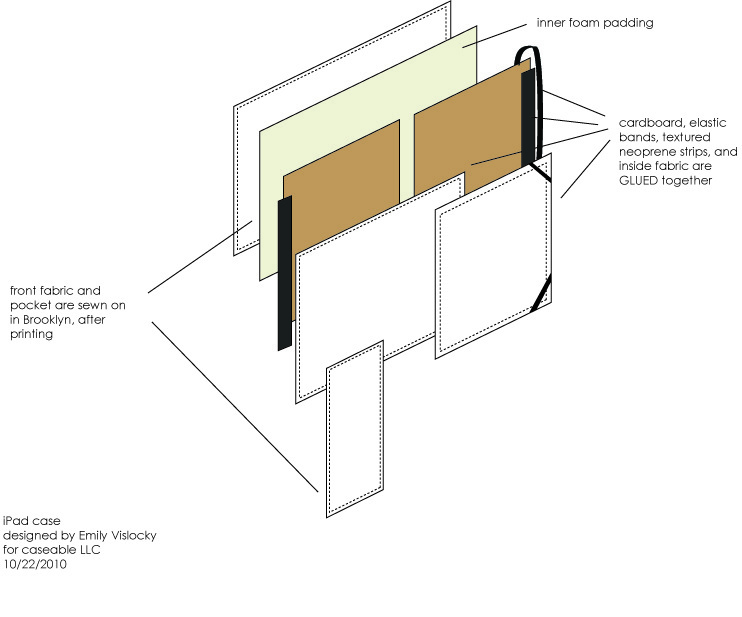 I wanted to design a product that could come be printed on in a fully assembled state. I wanted the case to have a built-in stand feature, but without it interfering with the customer image or the printing process. My solution was to have rubber-lined edges on the case that would grip a table surface and hold up the iPad. I sourced different rubbers and created prototypes to test these stand features. All materials for the case needed to withstand the temperature and pressure involved in the dye-sublimation printing process, and to take ink and showcase the printed image crisply and vibrantly. I worked with overseas sourcing agents to select and test the final materials. Leading not only design, but product development as well, I worked closely with factories, sending tech packs and prototypes back and forth, even visiting with them overseas, to create designs that could be produced efficiently.